UFC 236 betting will be headlined by a couple of rematches, including Max Holloway vs. Dustin Poirier and Ovince St. Preux vs. Nikita Krylov. The UFC heads to Atlanta, Georgia for a stacked card that is set to unfold at the upcoming UFC 236 event. A pair of interim champions will headline this card, with reigning UFC Featherweight champion Max Holloway challenging for the UFC Interim Lightweight title against Dustin Poirier. Meanwhile Kelvin Gastelum and Israel Adesanya will go toe-to-toe, with the UFC Interim Middleweight crown on the line. Let’s take a closer look at the Holloway vs. Poirier UFC 236 betting odds as well as the other matchups on the main card. This is a rematch seven years in the making. Holloway lost to Poirier via submission all the way back at UFC 143, but he is a very different fighter now than he was back in 2012. For one thing, Holloway hasn’t actually lost a fight since 2014. The UFC Featherweight champion has won 13 straight fights, including back-to-back TKO wins over UFC legends Jose Aldo and Brian Ortega. Holloway is moving up in weight and he could already deserve a shot at the Lightweight Championship if he beats Poirier. Considering all that has changed since their first meeting and the dominant run that Holloway is currently on, it’s clear why he’s expected to get the job done even though he lost the first time these two met. It’s worth noting that for the first time since 2016, Poirier is listed as an underdog. The UFC 236 fight odds have him at +180 odds compared to Holloway, who is favoured at -230. Israel “The Last Stylebender” Adesanya is coming off of a massive win over Anderson Silva that solidified his inclusion in the UFC’s Middleweight Championship conversation. After being the favourite in four of his first five fights, Adesanya will once again take on that role when he clashes with Gastelum for the interim title at UFC 236. While Gastelum has earned this opportunity with back-to-back wins over Michael Bisping and Ronaldo Souza, the 29-year-old Adesanya will be the toughest matchup of his career so far. Adesanya is an incredible striker who relies on timing and accuracy to deliver blow after blow standing up. Gastelum might have the edge in the ground game, but there is a good chance that Adesanya will stay on his feet as much as possible to maintain the edge in striking. Adesanya is posted as a -185 favourite, while Gastelum is up on the board at +150. Another rematch on the card pits Ovince St. Preux against Nikita Krylov once again. The first matchup occurred in 2014, and St. Preux got the win via a technical submission. While St. Preux has maintained his status as one of the best light heavyweights in the UFC, he has never been able to win the big one, with losses to both Jon Jones and most recently to Dominick Reyes. Meanwhile, Krylov took the long road back to the UFC by putting together four straight wins in other promotions before returning with a submission loss to Jan Blachowicz at UFC Fight Night 136 back in September. Krylov hasn’t gone up against quite the same caliber of opponents as St. Preux, which is why Krylov was listed as a slight underdog at -105 before increasing to -115, where he’s currently a pick against St. Preux. A couple of other intriguing fights on the card include Eryk Anders vs. Khalil Rountree Jr. Anders is fresh off of a tough loss to Elias Theodorou, but will face a much more favourable matchup versus Rountree Jr. While Rountree boasts knockout power, he’s also a one-dimensional fighter who is prone to putting himself in bad situations at times. He’s on the board at +145 while Anders is a -175 favourite. If you like Rountree, betting him to win by knockout might be one of the better UFC 236 prop bets in terms of value. We’ll also see a bout between Alan Jouban and Dwight Grant. Jouban snapped a two-fight losing skid with a knockout win over Ben Saunders in his latest bout, but he could be in tough again versus Dwight Grant, who is 9-2 in his professional career. Grant is coming off a first-round knockout win over Carlo Pedersoli Jr. back in February. Grant is a -105 underdog, while Jouban is listed at -125. Keep checking Bodog Sportsbook for fresh UFC 236 odds as we approach the big event. The world of combat sports changed forever on November 12, 1993, when the Ultimate Fighting Championship held their first event in front of 7,800 fight fans in Denver. Now they’re the biggest promotion in mixed martial arts, regularly packing large arenas, and even stadiums, thanks to the millions of people around the world who are betting on the UFC. If you’d like a piece of the action, this UFC Betting 101 guide will show you how to bet on MMA fights, plus some tips and tricks to maximize your betting value. 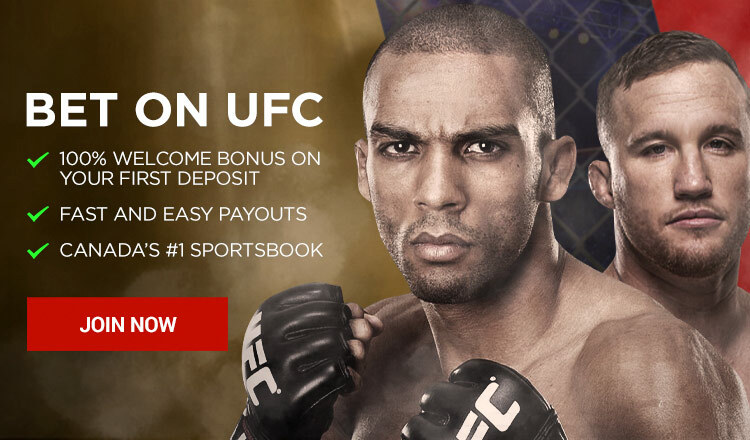 Like most head-to-head sports, including boxing and tennis, UFC betting is done using moneyline odds, which are expressed at Bodog Sportsbook using the American odds format. One of the fighters will be the favourite, and the other will be the underdog – unless they have exactly the same odds, in which case, the fight will be a pick ‘em. UFC moneyline odds are fixed odds, no point spread attached; all you have to do is pick the winner. The odds you get at the time you place your bet are the odds used to calculate your payout. What Are UFC Moneyline Odds? McGregor went into this non-title Welterweight bout at the UFC Featherweight champion, and an incredibly popular –400 favorite, paying out $100 for every $400 wagered. With the American odds format, the favorite will always have the negative sign; the underdog usually has the positive sign, as it was in this case with Diaz at +300. In the end, Diaz won this fight via second-round submission, and paid out $300 for every $100 wagered. Smaller and larger bets are allowed, within the minimum and maximum limits at Bodog Sportsbook. Chances are you’ll want to bet on more than one fight at a time. If you’re looking for a big payday, you can combine all those bets into a single parlay at Bodog. UFC parlays can feature anywhere from two to 12 moneylines; if you get all your picks right, you get paid exponentially more than you would by placing those bets individually. However, if even one of those picks is wrong, the entire parlay loses. It’s the classic risk/reward scenario in action. How Do UFC Parlay Bets Work? To figure out how much you’ll get paid if your parlay cashes in, just multiply the UFC odds for each fight in your combo bet. This can be a little tricky with moneyline odds. You can do it by hand, or by using one of the many parlay calculators available on the internet. Bodog Sportsbook will do the math for you automatically when you’re filling out your bet slip. Holm was the heavy favorite after taking the title in a shocking, yet convincing upset over Ronda Rousey, who had beaten Tate soundly in both their earlier fights. However, it was Tate winning the belt by submission late in the fifth round. If you had bet $50 on Diaz and another $50 on Tate, you would have earned $270 in profit, but combining the two underdogs in a $100 parlay would have paid $720 instead. The more fights you add to a parlay, the bigger the payout – as long as you get all those picks right. Betting on UFC futures can be a bit confusing compared to other sports, but it’s actually quite simple. Every once in a while, a situation comes up where two fighters might meet in the Octagon, but nothing has been made official just yet. If it’s two big-name fighters, and enough people are buzzing about their potential matchup, UFC futures odds will be posted. What Is a UFC Futures Bet? A futures bet in the UFC works exactly the same as a moneyline bet, with a favourite and an underdog shown as above using the American odds format. The only difference is you can’t use futures odds in your UFC parlay. UFC prop bets (short for proposition bets) ask you to wager on something other than the straight-up winner of a fight. Among the most common UFC props are Margin of Victory, where you bet on whether a fighter will win by TKO/KO/DQ, submission, or decision, and Total Rounds, where you bet on whether the fight will go Over or Under the posted total. Betting on UFC props gets even busier when there’s a marquee matchup on the card. It’s kind of like the Super Bowl; if the fight’s big enough, you might see props for things like which round the fight will end in, or whether a fighter will win by unanimous decision or majority/split decision. The more you know about mixed martial arts, the better you’ll do at picking a winner. But even if you’re a beginner, you can put the squeeze on your competition by going online and doing some quick research on the two fighters in question. As they say, styles make fights; a well-rounded MMA practitioner will be skilled at both striking and grappling, both on offense and defense. Look for fights where one opponent’s strengths match up well against the other opponent’s weaknesses. In general. someone with black belts in multiple disciplines (say, Brazilian jiu-jistu and Muay Thai) is more likely to prevail against someone with a lesser belt in just one martial art. You can also find betting value on the UFC props market by paying attention to the weight divisions. Smaller fighters tend to have more stamina, and they don’t pack the same punching power as fighters from the heavier divisions. It makes a big difference; in the lightest UFC division, Women’s Strawweight (up to 115 pounds), roughly 70 percent of fights end in a decision, while the men in the Heavyweight division (206-265 pounds) only go to the judges’ score cards about 25% of the time.